Pennsylvania is another one of those average states. On one hand they allow live poker in licensed and regulated casinos. However, everything else, like online poker and social gaming, is more or less undefined. So we don’t know where we stand legally, leaving us to assume that in a worse case scenario, it’s illegal. That said, there is currently a bill in progress that would legalize online poker and other casino games. And poker players can still find sites to play online. The consequences for running/participating in a home game are minor, too. So if you don’t mind bending the law (or waiting for laws to pass) it’s still possible to play poker in Pennsylvania. Pennsylvania doesn’t have any laws regarding online gambling. By default we’d assume that online poker would be illegal. One interesting thing worth noting, though. There was a court case in 2009-2010 where the judge was asked to define poker as a game of skill or chance. It was initially ruled as a game of skill, therefore not an illegal activity. However, the court ruling was overturned on 4-2-2010. Considering they overturned the initial ruling, I think it would be safe to assume that online poker is more illegal than not. Pennsylvania doesn’t have any laws regarding social gambling. Assuming that poker is considered illegal gambling, the person organizing and running a home game could face misdemeanor charges. That said, it appears that the players of such a game wouldn’t face any penalties at all. Do Casinos in Pennsylvania Offer Poker? There are a number of commercial casinos and racinos in Pennsylvania that spread poker games. There are no tribal casinos in the state. We receive a lot of questions regarding the legality of gambling in Pennsylvania. We thought it would be better to post those questions and our answers here, as opposed to answering them individually. That way everyone wins. Will online poker be regulated in Pennsylvania? It’s possible, sure, but the state is a long ways off. A bill, HB 1235, was presented to congress in 2013. This bill will make it possible for existing slot-machine license holders to apply for internet gaming licenses. In order to operate online within the state they’ll have to have a physical presence in the state. The bill includes poker and other table games. But, like I said, this is all a work in progress. This bill in particular was originally written in 2012 and has gone through several revisions since. Who knows if, or when, it will pass. And even then it will be months, possibly years, before Pennsylvania can offer legal online gaming. Is there an online poker room that accepts players from Pennsylvania? Yes. 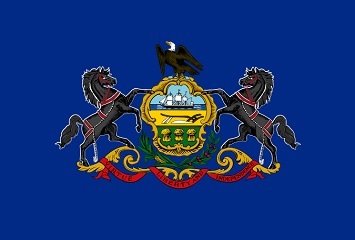 Pennsylvania residents can sign up to any poker site that accepts American customers. This includes sites like Bovada, Sportsbetting Poker, Americas Cardroom, BetOnline and Sportsbetting.ag. What other forms of regulated gambling is offered in Pennsylvania? Pennsylvania offers para-mutual horse racing, charitable games including bingo, game nights and raffles, and a state lottery. Where can I read more about Pennsylvania poker laws? Here are some interesting facts about playing poker and gambling in the state of Pennsylvania. Table games, such as poker and blackjack, have only been available in Pennsylvania casinos since 2010. No state took in more revenue from gambling taxes than Pennsylvania did in 2009, 2010 and 2011.